Just in case anyone’s wondered where I’ve been the past week – I mostly disappeared into the world of freezer cooking. I was originally planning to make a month’s worth of meals, and spread the prepping and cooking over a few days so that it wouldn’t overwhelm me. 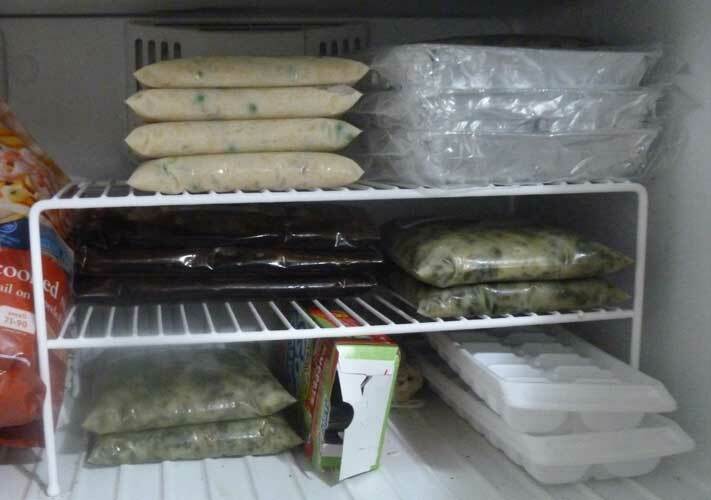 A small sampling of some of the freezer meals I’ve made so far. However, I either over-judged the ingredients I needed, or overbought, or over-planned…or under-thought the time commitment this would actually take. Because here I am, 4 days into this thing, and still have quite a bit to go! (I’m 38 weeks tomorrow; please don’t let me go into labor before I’m done, ha ha!) Granted, I’m not committing my entire days to making these meals; I’m just working around naptime, bedtime, and bits and pieces I can get done during the day. I also think that I’ll eventually end up having more like TWO months worth of meals by the end of this thing! I’m starting to run out of room in my freezer…freezerS that is. Other than just the fridge freezer, I also have a small chest freezer. I promise I will take pictures when this is all said and done, but I really don’t know if I’ll fit everything. Eek!! Oh, and I should mention that my ENTIRE KITCHEN is 10.7′ x 6.7′ (yes, I just pulled out a tape measure! :)) or ~72 sq. ft.
Can you explain freezer cooking? You just cook the meals as you would if.you are making dinner and then freeze them? Then you pull them out like you would a frozen meat, thaw and heat? Dinner served? That would be great!! I would love to cook a few meals for the week ahead if time and that would make dinner time so much easier. I love your blog!! !